This is the magazine’s second cover by Loveis Wise, and it evinces many of the same qualities as the first: a vibrant palette, an attachment to nature, and a loving study of women and their work. Wise, who grew up in Washington, D.C., and went to school in Philadelphia, told us a bit about the memories and meaning behind the painting. There’s such a sense of community in this image. What were you trying to depict? When creating this, I thought about the many moments from my childhood when my mother or grandmother would oil and style my hair. Those were moments of such love and care, and I wanted to make something sweet, relatable, and nostalgic to share with others within my community. You’ve spoken about how your grandmother inspires you. Was she in the back (or front) of your mind here? She definitely was! She co-owned a hair salon with my grandfather for over twenty years, and she often taught me the importance of taking care of my crown (or my hair). She taught me that it was part of self-love. There’s also a lovely attention to pattern and fabric in your paintings. What’s the source of that quality? As a kid, I was inspired by Ezra Jack Keats’s “The Snowy Day,” and by the various quilts my family had, so fabric and pattern have always been important to me. Pattern is another way to share stories; it adds layers to the narratives that I convey in my work. You just finished a few other projects. Can you tell us a bit more about them? 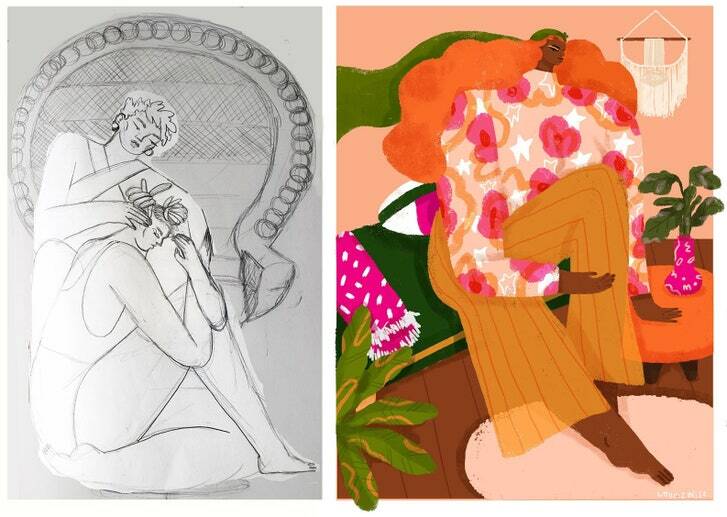 I’m currently illustrating two picture books, written by Zetta Elliott and Ibi Zoboi, two amazing writers. And, next month, I’m also unveiling a nature-inspired mural, which I collaborated on with Philadelphia’s Mural Arts and Ryan Strand Greenberg. It’ll be at the Navy Yard in Philadelphia.